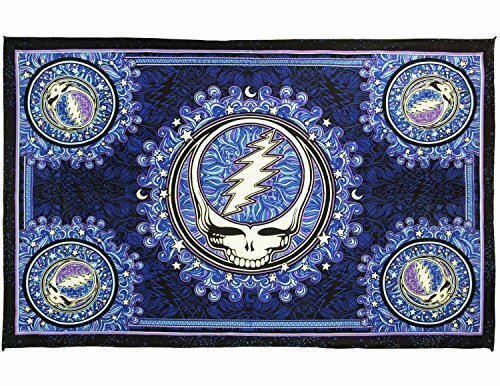 Brand new design, officially licensed Grateful Dead Steal Your Face tapestry is 60" x 90", made of 100% cotton and has loops on the side for easy hanging. Designed by Dan Morris. You can use this tapestry as wall hanging in your home or office, throw it over a couch, or as a bedspread on a twin bed. It would look great in a dorm room and even better under a black light. Going to a festival this summer? Hang it up by your campsite.